Fancy a jellyfish jelly? This is one I made for the Oxford Food Symposium Mad Hatter’s Tea Party on Friday. It’s just a home-made lime-and-lemon jelly with plenty of sliced jellyfish and some gouqi berries for colour. As you might expect, the jellyfish is transparent and has a jelly-like consistency, although one slightly more taut and elastic than that of the actual jelly. 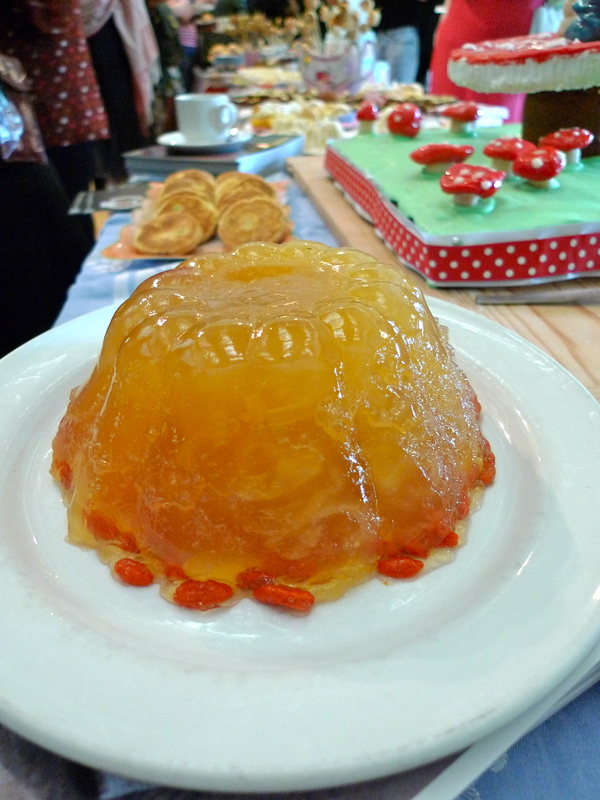 It’s completely tasteless, so please don’t imagine this lovely tea-time jelly has a fishy flavour to it. Like jelly, jellyfish has a very satisfactory wobble when moved from side to side (hang a strand from the end of your spoon and see). Has anyone else tried making a jellyfish jelly? Cover the gouqi berries in cold water and set aside until ready to use. Cover the gelatine leaves in cold water and leave to soften. Squeeze all the limes and the lemon. Place their juices in a pan with 450ml water, the ginger and the sugar. Heat gently, stirring from time to time, to dissolve the sugar, and then bring to the boil. Allow to cool for ten minutes. Then pour off a little of the hot liquid, add the drained gelatine leaves and allow them to dissolve. Add this mixture to the rest of the juice and mix well. Shake the jelly fish dry and add it to the juice mixture. Allow to cool. Wet a one-litre jelly mould. When the liquid is tepid, stir in the drained gouqi berries and pour into the mould. Refrigerate for several hours or overnight to set. Turn onto a plate to serve. I would love to try jellyfish, and this looks like the perfect way to be introduced to it! It’s bizarre – how was it received? Did it get a shaky reception? Boom Boom. Interested though, I like the cold jellyfish with vinegar they serve here in Fuzhou, so did you serve it with vinegar or any other sour/sweet condiment? Some of the guests were a little nervous I think; others tucked in with gusto! No, there was no vinegar – just lemons and limes, their sour juice balanced by sugar. And a hint of ginger. Those who dared to try it said it was delicious! Definitely the first jellyfish dessert I’ve ever seen! I’d love to try this recipe 😉 A very creative way of using jellyfish, and it’s for dessert!